Home | Seal-Rite Roofing & Siding, Inc. 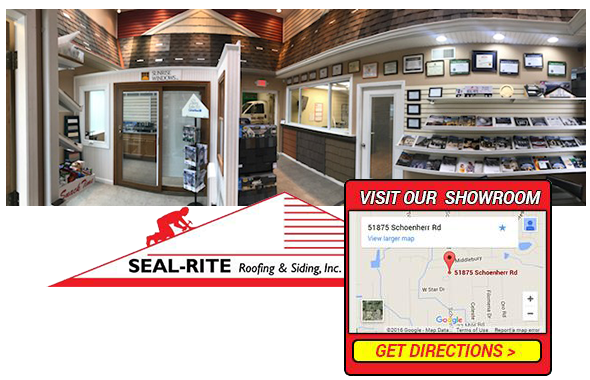 Since 1967, Seal-Rite Roofing has been providing roof, gutter, window and siding services to the residents of Shelby Township and the surrounding areas. Our family owned and operated business runs a showroom displaying all the quality materials we offer our valued customers. There, you can browse, learn about and choose the materials that will work best for your home. Our trained, dedicated home exterior professionals will be there to consult with so that you make an informed decision. For more than 50 years, the family owners and operators of Seal-Rite Roofing and Siding have seen the industry evolve. Now it is safer, the materials are stronger and more resilient, and the techniques are more precise for professional roofers to use. We make it a point to stay current by constantly working with industry professionals, trade organizations and manufacturers to stay current with new/improved techniques and products. This, in turn, has enabled us to pass that along to our valued customers in the form of longer warrantees and more informed roofing work in general. In addition to receiving the dependable, recognized customer service forged by over 50 years of being a roofing contractor in Shelby Township, you can take advantage of state of the art warrantees (A 10-year labor guarantee is standard but ask about our 25 and even 50-year warranties.). We also accept all credit cards and offer free estimates and consultations. You can always count on Seal-Rites dependable service and quality workmanship on any size job done by reliable workers who have been with us for a long time. We are certified roofers with CertainTeed Corporation. CertainTeed is a well- known, top-flight manufacturer of building materials which Seal-Rite uses in our roofing work. We are a certified contractor for this manufacturer. This means our sales staff and technicians are certified in CertainTeed products. Seal-Rite has worked for over 50 years as successful, professional Eastern Michigan Roofers. Over that time we have established a reputation for providing excellent customer service, quality materials and an overall exceptional contractor experience for our many valued customers. Thank you for contacting Seal-Rite Roofing & Siding, Inc., a representative will contact you shortly. Seal-Rite Roofing & Siding, Inc.